Is the Millennium Tower likely to fall over? In a word: NO. Editor’s note: “Left Coast Reflections” is a series of thoughtful musings by San Francisco-based architect Charles F. Bloszies, FAIA. Previous “Reflections” and his first series, “A Filtered View,” can be found at the bottom of this page. Based 5% on insider information and 95% on the laws of physics, San Francisco’s 58-story Millennium Tower is in no danger of tipping over. In this age of over-stimulated media, the rabid coverage of this issue has sown doubt in the minds of ordinary citizens about the competence of those of us who develop, design, and build large things. What actually did go wrong? The building has settled downwards and is, in fact, tilting. Most reports say the building has settled about 17 inches, and is leaning 14 inches westward and 6 inches northward at its crown. Settlement is normal, (more about that later), but what about the tilt? Let’s do a little math: at the top, the horizontal displacement is 15.2 inches (hypotenuse of a 14:6 triangle), and the building is 645 feet tall, so the Millennium Tower is leaning 0.11 degrees to the west-northwest. How significant is this? At its most precarious, Pisa’s famous tower leaned about 5.5 degrees, but it has been stabilized in recent times to lean “only” 4.0 degrees. Right now, its apex is displaced about 13 feet. The Leaning Tower of Pisa is only 183 feet tall; if the Millennium Tower leaned 4.0 degrees, its top would be displaced 45 feet! London’s 315 foot Big Ben is also leaning, but merely 0.26 degrees, a little over twice the tilt of the Millennium Tower. That’s enough math, but it does show that San Francisco’s tower is almost not leaning at all, especially compared to Pisa’s tower (and you probably didn’t even know about Big Ben). Yet 60 Minutes showed some San Franciscans maintaining they can clearly see the tower tilting, almost ready to tip over, and advise others to stay away. Sadly, they have fallen prey to suggestion based on the inability to distinguish between a priori truth and the opinion of anyone blurting out a tasty sound-bite. The story of the tower’s sinking was revealed by a suburban geologist retained by the homeowner’s association, a licensed practitioner, but one without any clear expertise in the design of tall building subsurface structures. He pointed out that the foundation piles do not go down to bedrock, but instead, rely on support from upper stratum sands and clay. Sounds scary, especially when parroted by lawyers, but friction piles embedded in strata above bedrock have been used successfully to support massive buildings in San Francisco for years. Bedrock, in San Francisco anyway, is over-rated. The word itself suggests solid, reliable, and dependable attributes, and in many large cities, bedrock must be blasted out with dynamite. But the Franciscan Complex in the Bay Area can be removed with a pick-axe. The problem here is geologic complexity; our bedrock is technically called a mélange by geologists, because it is a jumble of metamorphic rocks. There are all kinds of layers of various densities below the surface; strata capable of bearing the weight of a building are sometimes near the surface and sometimes very deep. This geologic complexity is responsible for our stunning topography, and it calls for sophisticated engineering. Bedrock is stronger than sand/clay, and, for a tall building in general, fewer piles are necessary when founded in bedrock rather than upper strata material. Economics usually governs the choice between fewer long piles compared to more short ones, but both systems have proved to be reliable. Days after the Millennium Tower story broke, marketers of nearby buildings under construction were advertising the fact that their foundations were solidly supported on bedrock. This is hyperbole – a large structure can be just as stable with foundations resting on sand or clay. 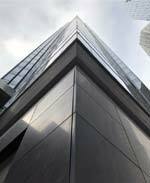 There is no dispute, however, that Millennium Tower has sunk more than predicted. Most foundations settle during construction, as the site is loaded by the dead weight of the structure, and once occupied, a building may continue to move slightly – usually nobody notices. In this case, something unusual took place resulting in more displacement than anticipated after the building was completed. The most plausible explanation is a change in the ground water level. Imagine that what lies below the surface in San Francisco is like a chunk of Swiss cheese, and the voids are filled with all kinds of stuff, including water. In fact, the cheese itself is more like a blend of hard and soft, and there are many fissures for water to migrate through underground. For the past decade, a building boom has been driving the economy of San Francisco, and many large, new projects have been built near the Millennium Tower. Excavations for these projects may have caused the ground water to shift, overstressing the clay layers below the tower’s piles, resulting in more settlement than anticipated. Most of the below-grade work near the Millennium Tower has now been completed, and credible experts have concluded that the building is safe. Given the relatively minimal extent of displacement, it is not going to fall over. Not even in an earthquake. In fact, most Bay Area residents were not fretting too much about THE BIG ONE until the New York Times ran a piece in April commemorating the 112th anniversary of our famous 1906 earthquake and fire. Following a template honed by Fox News, the authors cited various sources to question the wisdom of allowing San Francisco to build high-rise structures at all, let alone one like the Millennium T ower. San Francisco has been taking a big seismic gamble, they said. The most disturbing quote was from a Caltech professor who said of our buildings: “It’s kind of like getting onto a new airplane that’s only been designed on paper but nobody has ever flown in it.” What could this possibly mean? Since Gothic times, buildings have been “designed on paper” rather than by trial and error, and some of the most remarkable large-scale human creations owe their existence to mathematical abstractions that led to built reality. Designs are tested extensively using computer models, which is, by the way, how airplanes are designed these days, too. Well, since the days of the Barbary Coast, those of us living on the fault lines have developed coping mechanisms for dealing with the possibility of a major earthquake in our lifetime. Some have left – the most famous being Enrico Caruso, who was here for the 1906 event and vowed never to come back (and didn’t). Right now, the betting line is that a major earthquake of magnitude Richter 6.7 or greater along one of our three active seismic faults has a 72% chance of happening in the next 30 years. In the meantime, most of us will continue to enjoy our extraordinarily beautiful urban backdrop, one that would not even exist without the shifting land whose behavior is impossible to harness. Charles F. Bloszies, FAIA, is an architect, structural engineer, and writer – and principal of a practice in San Francisco focused on complex urban infill projects. He is the author of Old Buildings, New Designs – Architectural Transformations, published in 2011 by Princeton Architectural Press and now in its third printing. The idea that humans are able to create sustainable artifacts is, indeed, here to stay. But as designers of the largest artifacts on the planet, we architects need to be especially vigilant. The profession has a problem, and the advice proffered in "Women Who Work" (or any other insipid milkshake) is no cure. The wall may never be built, but the real damage the Trump Administration is likely to inflict on the built environment will have lasting consequences. A London cabbie asked if we had heard of the "iceberg houses." We should keep our pencils above grade most of the time. And we should support theories that preserve real icebergs before they trickle away completely. A Filtered View #2: Ubiquitous Stuff - Why is Most of it so Ugly? Maybe Apple should design all of this stuff; or maybe Philippe Starck. "Disruption" is the new buzz-word, but our new architecture (with a few exceptions) is anything but disruptive. A hallmark of a socially progressive environment is diversity - we need diversity in architecture, too. A Filtered View #4: Where is Sustainability's Flying Buttress? It may take a decade or so before photovoltaics and other energy-producing technologies find an aesthetic foothold, but for architecture to survive - they must. The perfect client offers up enough fuel to run the design jets at the most optimum level. In our culture of fashion-driven design, a sustainable building will have to succeed aesthetically to be truly sustainable. The Millennium Tower is nearly plumb; more so than Big Ben, and visibly more so than the Leaning Tower of Pisa. 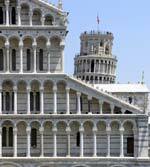 The most famous tilting building in the world peeks out the behind the Duomo di Pisa (Cathedral of Pisa). 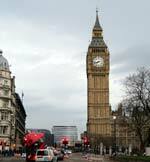 Big Ben tilts, too, but will take 4,000 years to catch up with the Leaning Tower of Pisa.